Content or Delivery; which is better? About a year ago I was running a session for some Learning and Development professionals on the Neuroscience of Learning. The person in question was unwell and the thought of turning up to an event, expecting to learn something new and instead being given post-it notes and coloured pens was more than they could cope with. We had an interesting discussion. 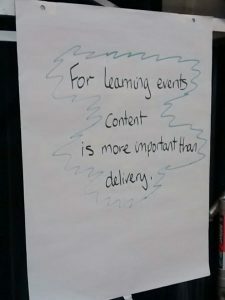 I have noticed more and more of exactly what they were talking about – a move towards L&D people being less about the content and more about the delivery. But is this a good move? I have a concern about lazy being dressed as facilitation and that the delivery becomes so important that good content is not included at all. Last month I facilitated a similar group of L&D professionals looking at some techniques for learning that were definitely not chalk and talk. At one point, dotted around the room, were flipcharts with provocative statements on. People were invited to look at them and discuss the statements with whoever was there, for as long as they wanted to, before moving on. I tweeted one of the statements and Twitter responded. This was the statement. There was also some talk about the importance of participation; that you can’t make someone learn. All true. So what’s the problem? I was reminded a while ago about a time when a group of us were running a residential and we ran out of activities. So we divided the delegates into two teams, asked them to design an exercise for the other team, then swapped the activities and sat back. Of course we facilitated the reflective session afterwards; we didn’t just walk away altogether, but I felt at the time, and still do years later, that this was utterly lazy. Yes they got something from it. Yes we helped them process the learning. But honestly, did we do the best for them? Could that time have been used better? I adore action learning sets but it has to be done right, for people who want and need it, when they want and need it. I remember once being on a course as a new manager where the facilitator gave us the opportunity to spend an afternoon together, with total freedom to manage our own learning, exploring whatever came up. I think the term T-group was used. So we all went back to work! We had left busy work places to come and get help with our busy work places. We didn’t see the benefit of chewing the fat with other, equally busy colleagues. This was probably a sign of our immaturity as learners but it was also a sign of a Trainer (they weren’t called L&D professionals then) experimenting on us with an idea and doing it very badly. They were a bit cross with us for not engaging. We were furious for being given so little when we needed so much. I love great facilitation. I think it’s an important, potentially life changing skill. I did a course 20 years ago at Surrey University about the dynamics of group work and facilitation that was possibly one of the best things I have ever done. However, I think there is also a place for designing great content. I think there is a place for lectures and teaching and instructional training. If I’m going for surgery I want my surgeons to have attended some recent lectures on the latest techniques and breakthroughs. I also want them to have discussed this between themselves and thought about how they can use these things effectively. I want them to do the full 100%. Great facilitation should not over-ride the need for great content, when that great content is what is needed. Chewing the fat can be amazing – give them something worth chewing.